With a quiet week at work, the husband working a lot this week and other than painting the kitchen - it was a good week/weekend of reading! 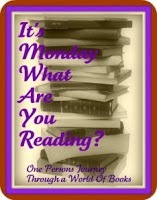 You have had a good week of reading! Cinder is a book I would like to read at some point. I know its been around for awhile, but sometimes takes a while to get to various books! I am intrigued by the Tahereh Mafi series Have a another great week of reading. I've been hearing about Tahereh Mafi quite a lot lately. Perhaps I'll have to look in to her series that everyone seems to be loving. You did have a great week. While I have seen the books by Taherah Mafi around, I haven't had a chance to read any of them yet. You must be enjoying them if you are continuing the series. Come see my Monday Report if you get a chance. Happy reading! Not read this series so I hope you are enjoying it. You have some good looking books going on! Tahereh is a genius! LOVE HER!